Seven Levels: The OM Mantra is a roadmap for sadhana, spiritual practices (written as either AUM or OM). It is not for the person who seeks only the shallow waters of spiritual life, but rather for those who strive to realize in direct experience the depth of the Absolute Reality. There are four main levels of consciousness outlined in the OM Mantra, along with three transition levels, which is a total of seven levels. Each of these is experienced on the inner journey of meditation and contemplation. Universal Realities: It is important to be aware of the fact that these levels of consciousness are realities that exist universally, regardless of whether or not one uses the OM Mantra or the visual OM symbol in any way. In either case, the underlying principles are extremely useful for all seekers in purifying or clearing the mind, and seeking the direct experience of deeper truths. The OM Mantra is recommended in the Yoga Sutras and the Mandukya Upanishad, as well as in many other teachings. Four major levels: When used in this way, the OM Mantra (AUM) has four major levels of meaning and experience to the Yogi. Waking: First, is the Waking state, represented by the sound of "A" of the AUM Mantra, called Vaishvaanara. Dreaming: Second, is the Dreaming state, represented by the sound of "U" of the AUM Mantra, called Taijasa. Deep Sleep: Third, is the Deep Sleep state, represented by the sound of "M" of the AUM Mantra, called Prajna. Turiya: Fourth, is the entire domain of that consciousness that permeates all of the other levels within which awareness does its dance, called Turiya (literally the "fourth"), represented by the Silence after the "A," "U," and "M". Three transition stages: Between these four states of consciousness, there are three transition stages called Unmani, Aladani, and Samadhi. Remember the four parts one after the other: Thus, in the use of the AUM Mantra, there are four levels of awareness that the Yogi wants to cultivate. The Yogi wants to remember the four parts of the AUM Mantra internally, one after the other, through the levels of consciousness. (The other three stages are also there, but these four are the main focus of the Yogi in using the OM Mantra). Remain aware of the meanings: With practice, it gradually becomes easier for one to maintain awareness of these meanings as attention moves through the parts of the AUM Mantra (The A, U, M, and Silence of OM Mantra). Over time, that awareness brings increasing insight of the true nature of these levels of consciousness. Eventually one moves to the direct experience of the Absolute Reality, that consciousness which permeates All (Silence after A, U, and M of OM Mantra). This is the state of Self-realization. 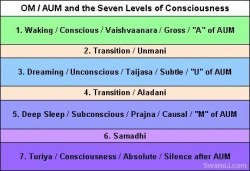 (Waking, Conscious, and Gross are all at the same level, symbolized by "A" of the OM Mantra). (Dreaming, Unconscious, and Subtle are all at the same level, symbolized by U of the OM Mantra). (Deep Sleep, Subconscious, and Causal are all at the same level, symbolized by M of the OM Mantra). (Consciousness permeates, is the foundation of, and in fact, "is" the whole of the levels of the A, the U, and the M levels of the OM Mantra).